"Andre Roy is a really cool hipster from Montreal originally, who studied at McGill University and Berklee School of Music in Boston. His sounds are cool jazz/blues/spiritual original compositions. You got to hear him live, what a sound!! Andre's music has a nobility, it is bold and heroic, groundbreaking and cutting edge at the same time embracing a great deal of respect and reverence for it's creators" Lynn McDonald - Toronto Jazz Promoter. He has spent many years in Toronto and is now a new member of the Southwest Florida music scene. 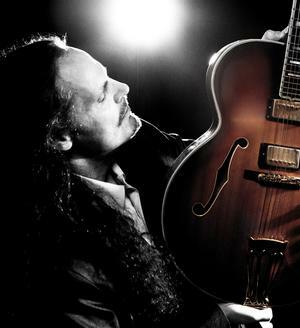 He has performed at countless jazz clubs and festivals in Montreal and Toronto. His US trio has included the amazing James Varnado, Mark Feinman on drums, Phil Magallanes on electric bass, Billy Pillucere, Mark Newenshaunder, Alejandro Arenas on upright bass. He plays beautiful vintage Gibson archtops guitars thru a vintage Fender amp and Leslie. COOL! Oh he also sings jazz, blues, rock and soul. Come check him out!! Ya he also plays a `68 Gretsch George Van Eps 7 string guitar tuned a whole tone down and classical guitar too! More cool!